Aurelia, Exemplar of Justice is quite interesting. 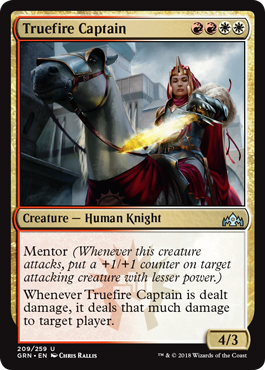 Of course, it did win the award for hundredth Boros commander that gives creatures ‘them pumps,’ but it’s about the way she does it. Let’s first state that she fits in most Boros decks as part of the 99; she’s just that efficient. A big plus is the mana cost: Aurelia, the Warleader and Gisela, Blade of Goldnight can be very expensive for our ramp-less Boros colors. The combinations of abilities make her very versatile, making her the possible commander of a whole array of strategies. She can be Voltron, with several kinds of evasion already built in. Protection her would be the most important factor there. She can be power-matters or Mentor-matters (which kinda is the same thing), because her ability synergises so well with it. An iteration of that idea is double strike-matters. Of course, she’s an excellent leader of a flyer or… Angel deck? (Some of these might be a bit of a stretch). 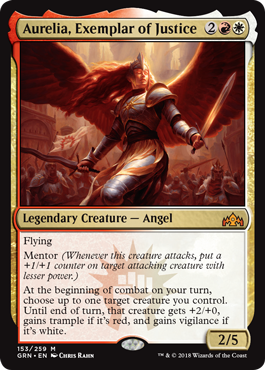 If you like Boros, you’ll like Aurelia. If you don’t… well, at least she has nice art. When spoiled, Tajic, Legion’s Edge was disappointing to many. 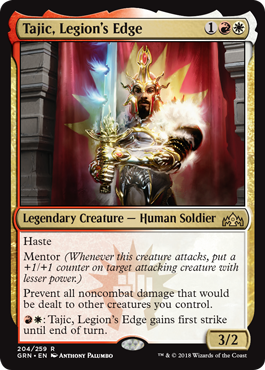 Because he was revealed on the last day of spoiler season, there was the hope that we could get a Boros commander that wasn’t focused on combat alone (especially because of the recent Firesong and Sunspeaker). Alas. His arrival evoked a lot of creativity among the Magic community: everybody discussed how they would design Tajic. I think it’s fair to say that he wasn’t designed for the Commander format, but with Standard/Limited in mind. That doesn’t mean he’s impossible, just challenging… and I love challenges (which is why I’m reviewing Boros). 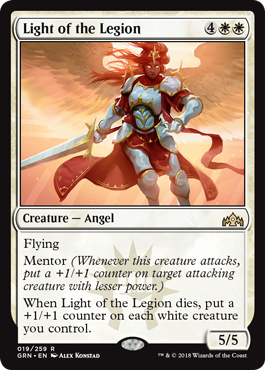 I’ll cover the Mentor ability in detail further down the article, so for this portion we’ll cover the other abilities of Tajic, Legion’s Edge. Here we find a lot of combat-related abilities: haste, Mentor, and possibly first strike, but those aren’t all too interesting a build around. Luckily, that’s not all: he also prevents all noncombat damage dealt to your other creatures. Even though he doesn’t grant that ability to himself, it’s interesting enough for a build-around. Earthquake.dec is a valid option, with instant speed versions like Magmaquake and flying-inclusive options like Blasphemous Act. 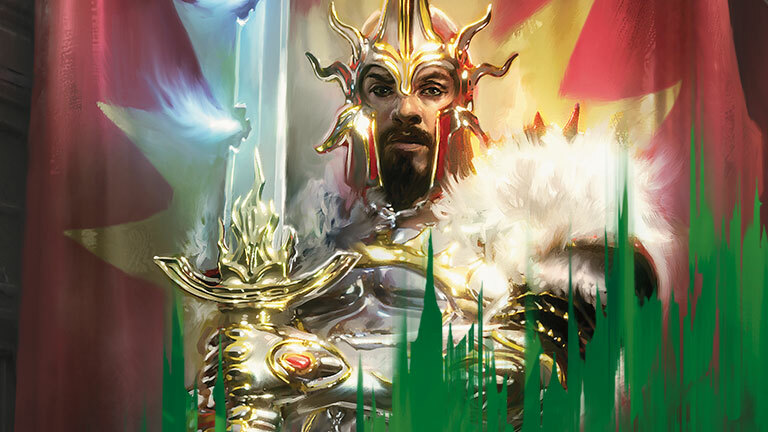 This strategy combines the control and go-wide versions of Boros: while Anger of the Gods would normally just be played in big red, Tajic helps even the smallest creatures survive that anger. Of course, this only works with our commander on the battlefield, and he dies everytime we cast Starstorm. That why we need to be able to protect Tajic and his disciples from this red-source damage with cards like Sword of Fire and Ice, Shelter, and Mother of Runes. Light of Sanction and Mark of Asylum even protect our entire board when Tajic disappears. This deck would play out similar as some versions of Archangel Avacyn. 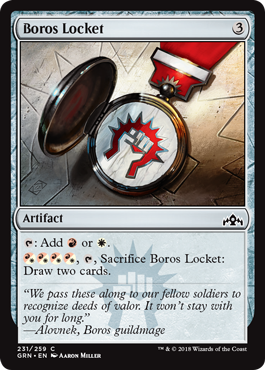 Boros Locket might be the best card for Boros in Guilds of Ravnica. The color pair famously has a very hard time ramping and drawing cards, and the locket provides both! Boros Cluestone, a less interesting option for a pure Boros deck, is the 23rd most played Boros card, played in 27% of all Boros decks on EDHREC. Another comparison is Hedron Archive, which is played in 20% of the Boros decks and earns a 38th spot in the Boros top list. 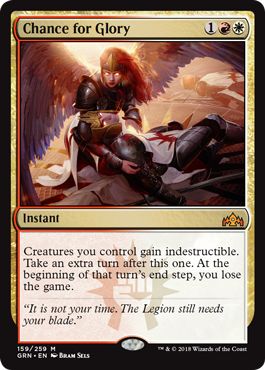 Although this also indicates some of the problems Boros decks currently face, we can safely say Boros Locket is a card to look forward too for all legionnaires. This card works similar to Final Fortune, Glorius End or Warrior’s Oath in that you can have “one… more… turn…” to win the game. In the case of Chance for Glory you have one more combat step instead. When checking the EDHREC website for these previous cards, we find that they are often used with commanders that have exponential effects, like Heartless Hidetsugu or Zada, Hedron Grinder. Often though, these are mono-red, and certainly not Boros. The most potential can probably be found with Narset, Enlightened Master, as her additional combat steps are very beneficial and might steal you the win. Oh, and be sure to read this card carefully: those creatures don’t lose indestructibility at the end of the turn. They keep it. If you can find a way to evade the game loss trigger (such as with Platinum Angel or Sundial of the Infinite) you get to keep a bunch of randomly indestructible creatures! Boardwipes are awesome when you’re behind, but a little useless when you’re not. Of course, this isn’t a real problem, but Deafening Clarion gives us a second option when this is the case. If your creatures have big butts, it even gives the option of doing both. It’s the lovechild of Slagstorm (played in 1081 decks) and… Ondu Rising, I guess? (Ondu Rising is played in 235 decks, but the mass lifelink effect is actually quite unique). The card also fits very well with the above-mentioned Tajic, Legion’s Edge deck. My favorite interaction is activating both modes with a card like a pumped Boros Reckoner for double the value! 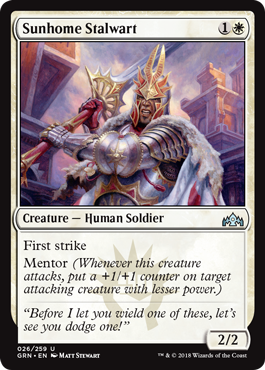 Justice Strike might be another card to consider for Boros commander decks. It kills 12/18 of the top played (creature) commanders. In comparison, Lightning Helix kills only 5/18 of the top commanders, while being played in 1769 decks. 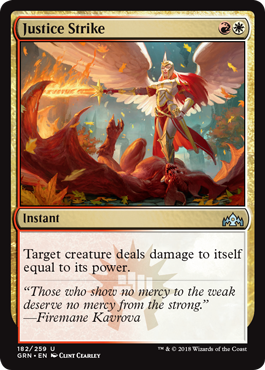 It’s safe to say Justice Strike will be showing up here and there, especially since it is tutorable by the Boros staple, Sunforger. Legion Warboss is best compared with Goblin Rabblemaster, a card included in 3007 decks for, I think, very obvious reasons: Goblins and tokens. The card is almost exclusively played in mono-red, where it’s boasting with all the interesting tokens it can make. Legion Warboss is actually very similar to Goblin Rabblemaster, and will therefore be added as a second copy of it in almost all of the decks containing it, or else simply become a good budget option for it. Light of the Legion does nothing for me. The recent Lyra Dawnbringer might be an option, but unless you’re desperately searching for that last Angel, it just doesn’t really add anything. Its abilities want you to play wide for a full benefit, but with a converted mana cost of six, there are much better options to find. Personally, this card is the biggest Boros dud for me. Ah, Response // Resurgence. I think the easiest way to evaluate the card is to look at it as an Relentless Assault variant. 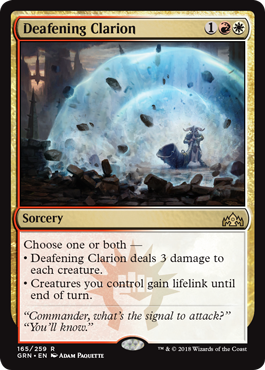 This effect is especially popular in Narset, Enlightened Master, Yidris, Maelstrom Wielder and Xenagos, God of Revels, all commanders that generate significant advantages from the combat steps (like our new Boros commanders would). Because of the color restrictions, my money would be on a predominant inclusion in Narset, Enlightened Master decks. 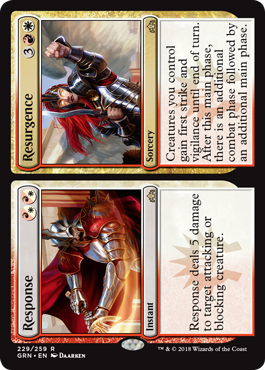 The big advantage Response // Resurgence provides is the semi-removal tagged onto it. This makes the card useful in dire situations where our board is empty and our opponents threatening. Swiftblade Vindicator is the most efficient small double striker I know, of which the closest comparison is Boros Swiftblade. The latter is played in just 336 decks, predominantly in Iroas, God of Victory decks (although no causations could be found). 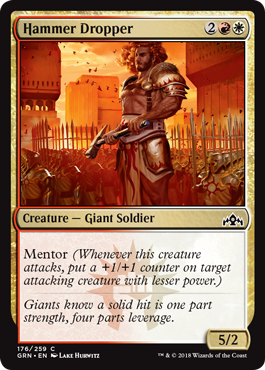 It’s especially strong with the Mentor ability, but is a strong additions to the Boros equipment decks as well, like Bruse Tarl, Boorish Herder and Akiri, Line-Slinger. 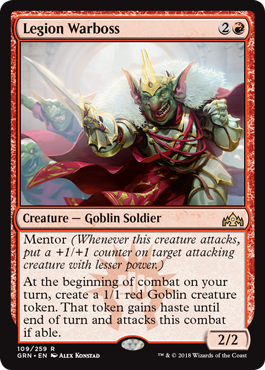 With this, Boros has almost gathered the critical mass of double strikers needed to create a true double strike deck, which I’m actually very interested to try out. I’m a big fan of Mentor. Really! But I fear it’s not a particularly good Commander mechanic. Still, it’s the first true +1/+1 counter mechanic that’s red/white, and that’s at least interesting. This opens up the combination of white and red counter synergies. Both colors have dipped their toes in counter synergies in the past, but never explicitly as a combination. If your playgroup is casual enough, I think a lot of fun is to be had with the keyword. I’m at least looking forward to its impact in limited Guilds of Ravnica. “I sure hoped you liked you stay here, cloaky boy. It’s time to return to the shadows from whence you came. Tell them about us, about the wonder you’ve witnessed from afar. You cannot tell me you haven’t felt the itch to join the ranks; to prove your worth to our steadfast guild. We face our challenges head-on. No knives in backs and poison in drinks, but glory for us all. If you want to hide in your shadows again, I won’t stop you. But there’s always a place for those who truly want to ignite the spark in their heart.